2012 Skipperliner 720 SL with flybridge, 72' x 18' steel hull, twin 300 hp Cummins diesel, 600 hrs, enclosed cooling, inboard V-drive, Cummins generator, unknown hours, 50a/125/250vac electrical service, six batteries, battery charger, Lennox high velocity central air conditioning, Side-Power bow and stern thrusters, Richmond 6 gal water heater, Lewmar electric windlass, Beam central vacuum, six person hot tub, pressure dockside water, Sea-Fire system, Sleeps 8 in four staterooms, Master stateroom aft with king berth, sink and vanity, ensuite Dometic head and stall shower, built-in cherry TV cabinet and bench seat, ceiling fan, VIP guest stateroom aft of galley with queen berth, wardrobe, ceiling fan, guest stateroom lower level mid-cabin cuddy with queen berth, guest stateroom lower level forward cuddy with queen berth, galley breakfast bar with four highback bar stools, heated ceramic tile galley sole, black solid surface counter tops, built in double sink, pantry slide-outs, large side by side built-in Electrolux 115vac refrigerator/freezer with ice maker, Maytag four burner stove and oven, Maytag microwave oven, Maytag dishwasher, Maytag trash compactor, Kitchenaid ice maker, dining area with table and four chairs, Frigidare stackable washer/dryer, cherry woodwork, off-white carpet, three ceiling fans, salon entertainment center, Vizio flat screen tv, Tundra sound bar, Nuvo stereo controls, Panasonic 3/D bluetooth, Integra receiver, salon "U" shaped sofa with chaise lounge, lower station helm with full instrumentation, electronic shift and throttle controls, Icom VHF marine radio, Uniden MC1020 depth sounder, back-up camera screen, Bridge deck, upper helm, helm seat, two electronic arches, upper deck hard top with full Isenglas enclosure and zip out windows, "U" shaped wet bar with stainless steel sink, Charmglow propane BBQ grill, two GE undercounter refrigerators, Maytag trash compactor, Kitcheaid ice maker, eight swivel high back bar chairs, six person hot tub, propane fire pit, numerous chairs and tables. Nautica dinghy, Nissan 30 hp OB, double electric davits, ITT Jabsco remote controlled searchlight. Please contact us for additional information! 6413 St. Croix Trail No. 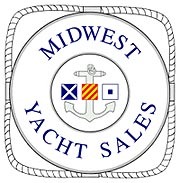 Other Boats from Midwest Yacht Sales, Inc.
View all Boats from Midwest Yacht Sales, Inc.